and Recycle”. “Reducing” and “Re-using” materials is the cost efficient strategy to waste management. opened up myriad opportunities for a profitable business! as the same product with a different owner. California residents threw out 4.4 pounds of garbage per day in 2011, a record low, the Department of Resources Recycling and Recovery (CalRecycle) announced. The rate is calculated by taking the total waste disposed at residential facilities and commercial businesses and dividing that by population. The rate has been calculated since 1989; the state had a high of 6.3 pounds per resident in 2005. The state’s overall diversion rate remains unchanged from 2010 at 65%, CalRecycle said. Clear Out Clutter while Helping Shepherd’s Gate — Recycle Used Electronics! The Shepherd’s Gate Thrift Store is partnering with Blue Star Electronics to raise funds for the women and children of Shepherd’s Gate by recycling electronics. We will be accepting electronics from 9:30am – 5:30pm, Monday through Saturday. We can recycle most consumer electronics, including televisions, computer monitors, LCD monitors & TV’s, LED monitors & TV’s, plasma TV’s, computers, hard drives, computer peripherals, laptops, DVD players, VCR’s, printers, scanners, fax machines, copy machines, telephones, answering machines, radios, cassette players, CD players, and much more! Please help us by dropping off your used electronics! If you have questions, please contact Patti at (925) 606-1924. If you would like to contact us regarding donating clothing or household items, please call (925) 606-1290. Please call (925) 606-1722 for large furniture pick-up. some research on simple ways to go green. Save water, save energy, and reduce waste! full load. Using just half loads uses twice the amount of water. you are waiting for it to get hot. Use it for plants, pets, cleaning, etc. “think before you print” footer. When in the shower turn off the water when you are shaving, etc. having to use the tap. When starting up the car go ahead and drive the car right away. Today’s cars don’t need to be warmed up. That causes unnecessary pollution. Use the window as a fan, electric fans are so out. In our lamps use energy saving bulbs. hours. Charge it when you get home, then take it out before you sleep. Donate your old furniture to a furniture recycler. Have garage sales or donate it to goodwill. grass to break down and feed the lawn underneath. instead of using paper of plastic cups. emissions made by making new clothes. unique gift bags. You will not only reduce waste, but save cash! time you need to cook with wine. Add a “think before you print” footer to your e-mails. Instead of buying little plastic packets of herbs, grow your own. Don’t have garden? A port or window box will do. Here are some of my own tips, tricks, and products! I used smaller font than I first planned. This helped save paper& ink. don’t use and never end up recycling. you need to recycle it! put your items in a different bag or bring a canvas bag. having a garage sale use them for the people with a bunch of stuff. can bring in plastic bottles to a recycling company and get money off of that. of getting the new paper cups every time. Use henna to dye your hair instead of actually hair dye. P.s. Think before you print 😉 How about forwarding? Blue Star Electronics, LLC in Hayward, CA 94513 provides secure HIPPA compliant destruction, shredding and disposal services of hard drives, backup magnetic tapes and other storage devices. E-waste is growing exponentially simply because the market in which these products are produced is also growing rapidly as many parts of the world cross the so called ‘digital divide’. For example, between 2000 and 2005, the Organisation of Economic and Cooperative Development (OECD) notes a 22% growth in Information Communication Technology (ICT) in China1. Furthermore, China was the 6th largest ICT market in 2006, after the US, Japan, Germany, UK and France.2 This is astounding when one considers that just ten years ago, under 1% of China’s population owned a computer3. Computers are only one part of the e-waste stream though, as we see that in the EU in 2005, fridges and other cooling and freezing appliances, combined with large household appliances, accounted for 44% of total e-waste, according to UNU’s Study supporting the 2008 Review of the Waste Electrical and Electronic Equipment (WEEE) Directive.4 Rapid product innovations and replacement, especially in ICT and office equipment, combined with the migration from analogue to digital technologies and to flat-screen TVs and monitors, for example, are fuelling the increase. Economies of scale have given way to lower prices for many electrical goods, which has increased global demand for many products that eventually end up as e-waste. 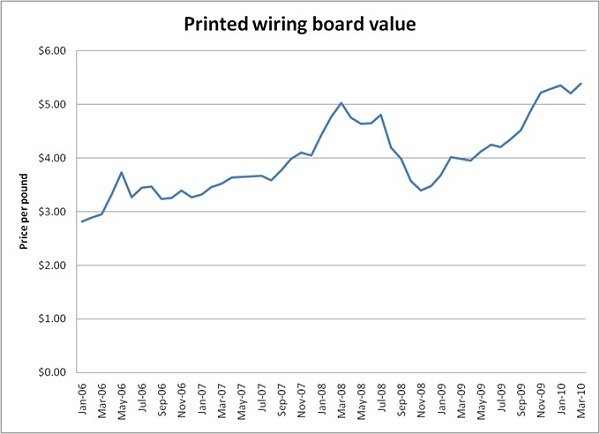 According to E-Scrap News The gross value of printed wiring board scrap hit yet another all-time high in April at $5.64 a pound, up 4.4 percent from March’s totals of $5.39 per pound and 29.9 percent higher than the year-over-year value of $3.95 per pound. This data represents the full metallic values of boards over time and are not the recycling values, as those values do not include the costs involved in actually extracting metal from boards, including freight, sampling charges, assay assessments, smelting, refining, process loss, return on investment, and penalties for various elements, including beryllium, bismuth and nickel. These values are for the estimated intrinsic metal content of recovered PC boards. Some consumers label such material as mid-value. Lower-value scrap includes monitor and television boards. Higher-value scrap includes network and video cards, and motherboards. The average value of board scrap for the first four months of 2010 is $5.40 per pound, a 27.7 percent jump over the same period last year. April 22, 2010 will mark the 40th anniversary of Earth Day. Blue Star Electronics, LLC reminds you to recycle your E-Waste. Hard drives, Computers, Notebooks, Servers, PCB Boards, Monitors, TVs and much more.